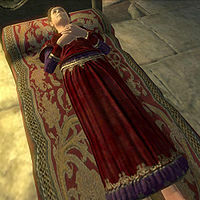 Rona Hassildor is an Imperial noble and wife of Janus Hassildor, the Count of Skingrad. Although she and her husband are both vampires, Rona has been unwilling to accept her condition. In particular, she has refused to feed and as a result has fallen into a coma. She wears a red velvet blouse, a piece of jewelry and a red velvet garment. She also carries a large amount of gold. You will hear about Rona for the first time when you approach Janus Hassildor about a cure for vampirism. He will then explain the tragic tale of his wife and why he seeks a cure himself: "I wish to tell you a story, so that you might understand why I would trust you with my secrets. Would you hear it?" He will then continue: "More than 50 years ago, my wife Rona and I were both turned into vampires. While I came to embrace the changes in myself, she did not. She hated what she had become, and refused to feed to keep herself healthy. She eventually slipped into a coma from which she has not awoken. 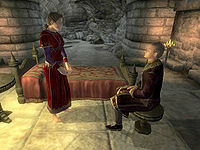 My trusted servants have cared for her all this time, but I wish for her to at last find peace. The cure is for her." Janus: "Rona, my dear, it's time to wake up." Rona: "What? Janus... please, no. Let me sleep. Please, let me sleep." Janus: "It's all right... it's all right. I've come to give you peace at last." Rona: "I can... rest? Truly?" Janus: "Yes, my dear. Just drink this, and it will all be better." Rona: "Oh, Janus. Thank you... thank you for saving me." After this conversation, Rona will drink the potion and immediately die, due to her weak condition. Janus will be understandably sad: "My wife... my beautiful wife. Now is not the time for discussion. Give me a day's time to set her affairs in order." After a 24-hour grieving period, Janus Hassildor will thank you in person: "It is good to see you again, my friend. I cannot thank you enough for helping me rescue Rona from the terrible state she was in. I hope that she has found the peace she sought. I'd like to offer you a reward for your efforts. Thank you again. I shall rest easier now, knowing that Rona no longer suffers." Esta página foi modificada pela última vez à(s) 05h45min de 20 de outubro de 2015.